As the 3D printing industry has expanded, many have speculated on which companies would enter into the space and emerge as market leaders. We’ve seen new companies like 3D Systems begin to operate in the industry, as well as existing companies such as HP and Intel step into the space. Now, Samsung seems to be preparing to throw its hat in the ring on a larger scale. Coming on the back of a recent announcement to create a team exploring, among other things, 3D printing, a patent filed by Samsung in September 2014 has recently been released. The patent covers a new proprietary multicolor 3D printing process, and South Korea-based Samsung employees Yeon Kyoung Jung, O Hyun Beak, Keon Kuk, Eun Bong Han, Yong Hyun Lim, and Jong Youb Ryu are credited as inventors. The process described covers a proprietary 3D printer, a method to control the printer, a multicolor photocurable ink, and an anti-intercolor bleed agent. The printer has several tanks to contain the multicolored ink and anti-bleed agent. It also has print heads for each of these materials as well as a photoinitiator attached to the print heads to cure the materials while printing. During the printing process, the print heads would move along the guiderail [1b] and the print platform  would move along the x, y, and z axies. The print heads will apply layers of multicolored ink as well as the anti-bleeding agent in between while using the photoinitiator attached to the print heads to cure the object while printing. The whole process is designed to prevent the intercolor bleeding that occurs when ink compositions with different colors are printed adjacent to one another before curing during 3D printing. Many others have been working to create viable processes for multicolor printing. Sculpteo has a process creating multicolor 3D printed objects by adhering colored powder to the prints during the process. Others, such as the DreamMaker, have launched a Kickstarter for their multicolor printer allowing users to change the filament color mid-print. Samsung’s design is unique in that it is one continuous multicolor printing process. But more importantly, it may mark the company’s intent to wade further into the waters of the 3D printing industry. 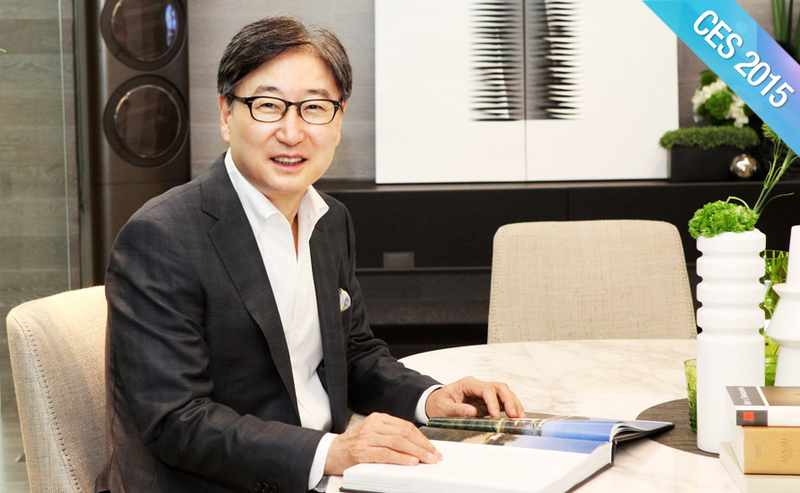 Recent statements by the company’s CEO, Boo-Keun Yoon, have made it clear that the company sees a lot of future potential in the Internet of Things, or IoT. With the announcement of their team tasked with exploring 3D printing and other innovative technologies, as well as Yoon’s other recent statements at CES Las Vegas saying they plan to invest up to $100 million in the developer community for applications for the Internet of Things, one can only imagine the full spectrum of the company’s vision. Samsung expects to have 90% of their products connected to the internet by 2017. This could mean 3D printers are synced up with machines to automatically print a new part when older operating parts are wearing down or broken. It could also potentially mean buying a cellphone cover for your Samsung smartphone on Amazon and, once the transaction goes through, it immediately begins printing for you in whichever vibrant color you’ve chosen. It’s certainly exciting to think about the broader applications of 3D printing in parallel with other technological developments occurring. As innovation in the 3D printing industry continues to march on, it seems that Samsung is intent on exploring how they could play a larger role. Let us know your projections for the involvement of a global giant like Samsung in the 3D printing industry, and what that might mean for innovation, in the Samsung Patent for Multicolor 3D Printing forum thread over at 3DPB.com.